A seller on ebay named cassini_sunset is posting listings for armor using images from other listings and has admitted to me that he does not actually have pictures of his own product. Obviously this person is a scammer and getting ready to rip off an unsuspecting noob. Spread the word! He currently has Stormtrooper armor, bikerscout, First Order armor for sale and its all fraudulent. 2 of the images are from MTK armor listings....ITS NOT MTK ARMOR! BUYER BEWARE!!!! ROTJ helmet decal interest list! Back from the dead!!!! Its the ROTJ decal thread!!! No I dont make them specifically for ROTJ anymore. I mean I still have the files and I could make you some but there is not alot of demand for them so I stopped selling them a while back. 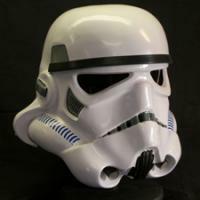 I DO however sell ESB decals on trooperbay.com that are very close to ROTJ. Thanks Paul. I had some choices to make and I figured I would shoot this across the bow and see whats what. It seems that even as popular as Anovos has been, troops still prefer the fanmade sets and that is awesome. The improvement posts are off topic but thats generally how it goes, lol. I was just curious what might need to be changed. Thanks for your input everyone. Sounds like some finicky stuff. Ah so its just too thin in areas. I helped trim out some of the 1st Anovos armors ( a few pieces) and it was very brittle then. No way you could score and snap those. I think it's more of a mileage, communication and tooling thing. It took Anovos forever to get the Chinese to even come close on many parts of the armor. The Chinese are constantly looking for shortcuts. Many parts were changed without consulting Anovos and then there is the communication gap. Anovos probably clocked 2 or 300,000 miles flying back and forth to China. I wasn't personally involved but I did pick this info up from conversations with them. Disney has a process for approval just like any company. I don't think they would care all that much if it was too accurate. There are many props that are licensed now that are spot on in my opinion. Sounds like there is a lower amount of butadiene in the Anovos ABS. Less butadiene will give greater detail and make the armor increasingly brittle like styrene. Increased butadiene will give the armor resilience but less ability to draw into the the bucks and hold shape. Also keep in mind that this stuff is made in batches. The next batch of armor they do may have totally different ABS. Different color, different composition... Regarding MTK specifically, what do you think needs to change? All this being said. You cant mass produce stormtrooper armor. It's impossible. Too many details have to be messed with so that the manufacturing process can be easy. So there will never be any company that can replicate the detail that fan made armorers can. The companies want to make money. The armorers want to make armor. All very good points. I have a decision to make and your input has been helpful! There are pros and cons to each side for sure. Oh? Why do you say that? Alot of people traded their existing set for Anovos. I have only seen the helmet. Do you feel that the Anovos kit is acceptable or does it need alot to be "accurate" enough for us? If you had a choice to buy Anovos stormtrooper armor for $503.00 free shipping but had to wait for the presale to end... OR buy a fanmade armor like MTK or others for $650.00 free immediate shipping, which would you prefer?